This page describes the graphics activities in the lab. The mobile computing research and development activities are done under professor A. Nahapetian's supervision. COMP 465 Introduction to Computer Graphics . A fall semester class using OpenGL in which student learn fundamental concepts and gain experience developing interactive 3D scenes. COMP 565 Advanced Computer Graphics. A spring semester class using C# DirectX in which students will design and develop non-immersive (or fully immersive) virtual environments with an emphasis on games. Interactive 3D Computer Worlds / Games. Design and develop worlds (virtual spaces, possibly distributed) where one or more participants explore and interact. Scientific Visualizations. Design and develop freely explorable simulations / animations. HCI Experiments. Design, develop, and conduct experiments evaluating human-computer interactions. Devices: stereoscopic LCD shutter and head mounted displays, data Gloves, infared trackers, joysticks and mice. 3D Graphics APIs: DirectX, XNA Game Studio, and OpenGL, X3D / VRML. COMP 465, introduction to computer graphics course. COMP 565, advanced computer graphics course. Undergraduate Independent Study projects (CS 499C). Graduate Projects (CS696C and CS698C). 3 dimensional game design, development, and analysis. Scientific Visualization design, development, and analysis. VR world building: design, development, and analysis. VR interface devices; we need new drivers written in C# for use with Direct X. The lab is in Jacaranda Hall JD 2212 ( second floor). If you want to participate, contribute, have questions, or want a tour contact G. Michael Barnes by email renzo@csun.edu . The VR lab supports several current projects and will try to support all contributing individuals and their projects. The lab can be used for faculty and directed graduate and undergraduate projects. Mike Barnes, research and development of simulation experiments concerning memory and learning with Non-Playing game Characters (NPCs), procedural modeling, and porting "legacy" VR device drivers for the lab. David Lu Testing the Effects of Memory Structures and Recall on Non Playable Characters in Unity3D , Aug 2013, abstract (pdf). Bjorn Davis Terrain Generation Engine using Voxels , May 2013, abstract (pdf). Lianhua Shen Face Recognition and Disguise , May 2013, abstract (pdf). Phillip Malinoski Object Detection and Recognition for UAV , May. 2012, abstract (pdf). Stephen Burns Virtual Reality Simulation using Stereoscopic Vision and Motion Tracking , Dec. 2011, abstract (pdf). Jeremy Staples Serious and Purposeful Video Game Environments , May. 2011, abstract (pdf). Javier Reyes, Data Glove Interface for a Virtual Environment , May. 2010, abstract (pdf). Kristofer Shinn, Digital Signal Processing with a GPGPU Implementation , May. 2010, abstract (pdf). Luis Vasconez, Threat Analysis using Fuzzy Logic applied to the Evading and Chasing Algorithm , May. 2010, abstract (pdf). Dennis Walsh, Parallel Collision Detection Utilizing the CUDA Architecture adn DirectX9 , May. 2010, abstract (pdf). Atsuya Takagi, MultiTouchJ: A Wii Remote and Video Projector User Interface. , May. 2009, abstract (pdf). Neha Limaye, A C# Managed DirectX Client Server Library for Shared Environments , Dec. 2007, abstract (pdf). Kristina Shroyer, A Study of 3D Facial Modeling and Aging with Project Applications in MAYA , May 2007, abstract (pdf). Khaleel Ali, Shading Language for 3D Graphics , May 2006, abstract (pdf). Francisco Vassallo, Starship Combat Game: Anchors Aweigh, Dec. 2003, abstract (pdf). Qi Fang, A Small Architecture Oriented Volumen Modeler, May 2003, abstract (pdf). Joeseph Parham, Facial Animation Using Dynamic Subdivision Surfaces , May 2003, abstract (pdf). Henry Demirchian, Stereo 3D Presentation of the Human Digestive System, Dec. 2002, abstract (pdf). 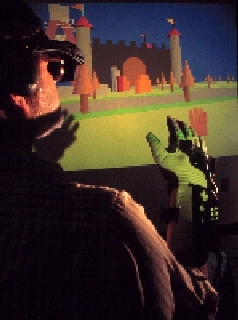 Michael Stark, A Glove Gesture and 3D Position Tracking Interface, Dec. 2002, abstract (pdf). Irina Goldman, Visualizing Java Class Libraries, May 2002. abstract (pdf). Peeti Jittiphalangsri, Space Battle : a networked multi user game, December 2001, abstract (pdf). Ying Qian, Developing a Multi-user, Shared, Java 3D API Behavior Class, December 2000 Master thesis, abstract (pdf). Qi Wang, 3D Graphical Representation of Object Oriented Programs, December 2000 Master thesis abstract (pdf). Inga Leu, Troubled Bubbles: A Java 3D Game, May 2000 Master thesis abstract (pdf). Ervin Bakhshian, Pepi: a study of Facial Animation with Maya, December 1999 Master thesis abstract (pdf). Hanna Issa, A Three Dimensional File Visualization Tool using Java 3D, December 1999 Master thesis abstract ( pdf). Mark McCluskey, Visual Fatique Assoicated with Stereoscopic Head Mounted Displays, December 1999 Psychology Master thesis abstract. Vartan Nazarian, Video Telepresence: A Remote Control Camera, December 1999 Master thesis abstract and screen pictures (pdf). Lynne Winner, Virtual World Command and Output Experiment , December 1997 Master thesis abstract . Saad Mastoub, An Adventure Virtual Reality Game, May 1997 Master project abstract and game snapshots. Blender, 3D modeler and game engine (open source) Blender Foundation. Direct X and XNA Game Studio 4 refresh , Microsoft. X3D / VRML Web 3D Consortium. 5DT Data Glove by Fifth Dimension Technologies. CrystalEyes by Stereographics stereoscopic LCD head mounted displays..
Head mounted display by i-O Display Systems. Stereoscopic 3D head mounted display. We need to attach older iglasses tracker to display and update driver re-written for DOS in C for use with DirectX in C# (or openGL in C or C++). TrackIR by Natural Point, infrared head trackers. 2 computers with an Intel quad core 3.0 ghz processor, 4 gb memory, 250 gb disk, 24"e; wide screen monitor, NVidia GTX 88000 graphics card with 512 mb memory and 128 stream processors running Windows Vista business. Note: the 128 stream processors can be programmed for any parallel application with Nvidia's Cuda. 2 computers with 64 bit dual core Intel Pentiums 3.4 ghz processor, 2 gbyte memory, 250 gb disk, dual 19" LCD and CRT monitors, and NVidia Quadro FX 4500 graphics card with 512 mb running Windows XP Pro. 2 computers with an Intel Pentium 4 2.2 ghz processor, 512 mb, 80 gb disk, 19" monitor, NVidia GForce 4 Ti 4600graphics card w/ 128 mb. One is running Windows XP Pro and is used for image scanning, music server, and generic computer tasks. The other is running Ubuntu 6 (linux). Both of these systems can be used for student and graduate projects that require cgi-bin, java servers, .NET, and other services not available for projects on the College's production instruction machines. The CSUN Virtual Reality Lab grew out of a meeting of students and faculty interested in developing a virtual reality capability at CSUN. This group met several times before the earthQUAKE (Fall 1993) and wrote proposals for equipment and funding. While the proposals were not successful in their initial attempt some "seed" money and equipment were allocated. However, the quake sets things back a little... In the spring of 1995 we were reestablished in the current lab (JD 2212). In the fall of 1995 the Dean of the School of Engineering and the school's research and resources committee supported our efforts with a small grant. Over the years Mike Barnes has donated his Honors COOP and other "extra pay" funds from the univesity to the VR lab's research account. With the advent of the CS595VR experimental course in the Fall of 1997 (now COMP 565) the CS Department has provided most of the money to support the lab. In 2005 the Japanese Patent office supported Takao Tsubata's sabattical and research in the lab. Would you care to provide some support to this lab?